CShop has been delivering class leading ecommerce solutions to small, medium and large businesses since June 2000. We work closely with our customers to deliver feature rich products that maximise multi-channel sales by implementing best of breed technology along with our own in house developments. CShop is vast in features that enable you to maximise and increase web sales, manage your SEO, understand and track where your orders are coming from, while seamlessly interfacing to your own systems if required. CShop comes complete with comprehensive management tools to help you make the most of online sales opportunities, integrate to third parties such as eBay, Amazon and stock management systems. From our off the shelf ready to go templates, to our fully bespoke build or anywhere in-between, CShop can find a solution that fits your business needs. Even if all you require is a call centre module or stock management tools for your store then CShop has a product for you. The feature rich CShop dashboard allows you to fully manage your online store with tools to control the order process, customer interaction, product inventory, offers and much more. CShop can link with your back office system and warehouse management system, automating the transfer of data back and forth from the web seamlessly. 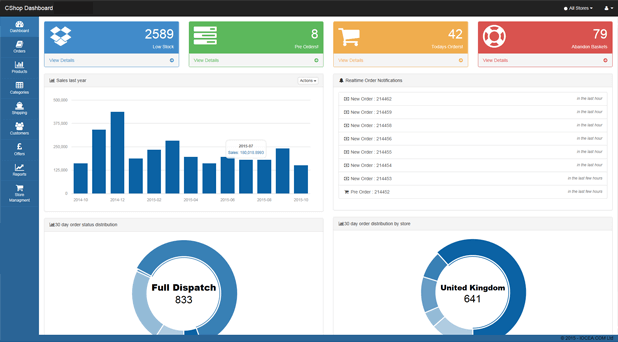 An interface to your site's data allowing you to manage products, stock levels and orders. The Cshop Admin offers you full access to manage your store. With the ability to create, edit and delete products, customers and orders you are able to manage the full end to end from set up to order dispatch. With links into Google Shopping, RSS Feeds, Social Media, and many more product feeds, we can get your products into such a wide audience to help maximise sales. It is important you can track where your sales came from so CShop links to many tracking facilities such as Google Analytics giving you the ability to report on which channels are sending you the most traffic and converting. CShop links with many Payment Service Providers, such as SagePay, Creditcall, PayPal, any many more, leaving your payments secure and verified with your bank. Our PSP integrations can help you become very advanced with your rules, from 3D secure, Third Man, AVS/CV2 checking and when you take payment. Content on an website is very important, and with CShop’s integrated blogs, it gives you the way to easily add articles to your website giving you not only content for your customers to read, but changeable content for search engine crawlers to pick up and index around the web.